imin[a box] functions as the raison d’etre for “imin”, the device created for the piece. imin—an inversion of IMAX—is “the future of entertainment, and the future of your reality.” That future happens to be a video-based virtual reality device capable of monitoring a viewer’s response to an experience, so that it may deliver new content tailored to the viewer in real time. At least, so the narrative goes. Upon entering imin, the viewer sees a live stream of the space surrounding the device, provided by four webcams evenly distributed about the top of the box that houses the screens. Once the participant is comfortable, the live stream fades to a video sequence—the “calibration process”—created exclusively for imin. Video continuity between screens, as well as spatial audio cues encourage/direct the viewer to look all aroundthroughout the experience. The sequence ends, and the screens fade back to the live view of the surrounding environment, where a slight visual distortion now affects the live stream. The viewer may exit, if they like. imin[a box] provides a distorted view of the immersion and individualized content we seem to desire more and more through ever-advancing technologies like virtual/mixed/augmented realities, hyperreal 3D graphics and personalized Facebook feeds. The physicality of imin is itself isolating, and its promise to adapt in real-time to the desire of the individual suggests a dystopian feedback loop of bland sameness. Above: the imin video sequence created for the 2014 ICAM install show. The text under the videos denotes the position of each video inside imin. However, in imin, there is no front, back, right, or left. Note: A portion of the video is site-specific: the beginning and ending sequences were shot in the gallery where imin was presented. This way, when the live webcam feed faded to the videos, and back again, the locations in both the feed and the beginning/end of the sequence remained the same. imin [a box] is a cinematic chamber designed for use by a single participant. 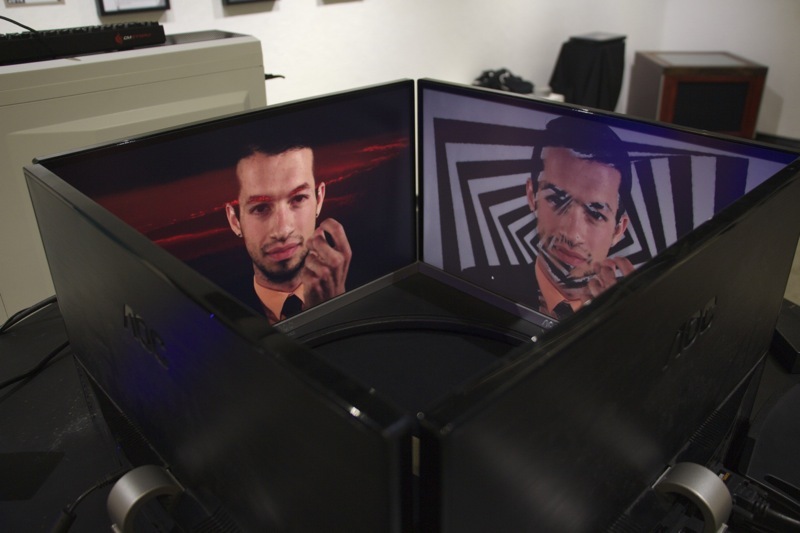 Four 22” LCD screens arranged in a square surround the participant’s head, creating an intimate, 360° enclosed environment that allows for a completely immersive video experience. A five-sided black box (4 vertical sides + 1 top side) houses the four screens, effectively blocking out the light and sound of the external world. 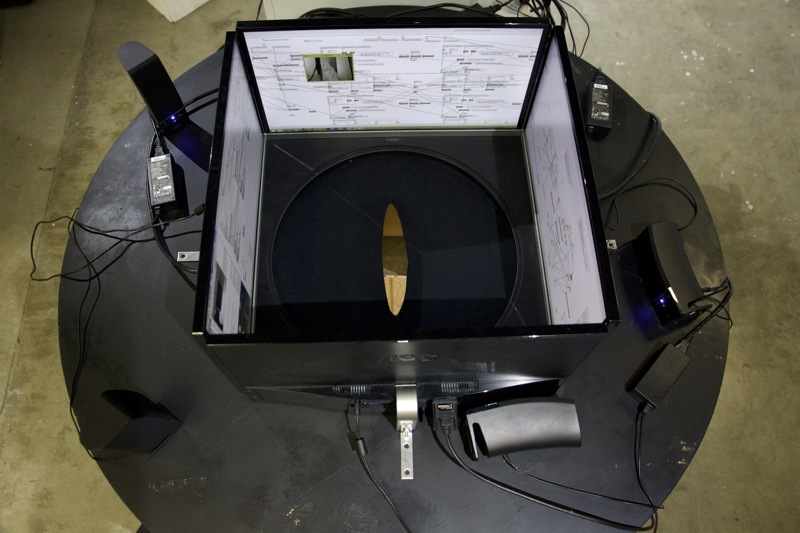 The screens and covering box rest atop a circular table with a 17.5” diameter hole in the middle, allowing entry for the participant’s head. Attached on the top edges of the outer box, in the middle of each side, are four webcams, which transmit live video of the surrounding space to the inner screens. Placed behind each screen is a single channel speaker. The participant engages with imin first by sitting on a fully rotational chair; then by raising their head through the hole, they are met with a live feed of their surroundings. The body remains out in the open, separate from the head, to be used as a tool to facilitate 360° rotation. Once the participant is ready, they may begin their scheduled content viewing. The live feed of the surrounding space fades to video content created specifically for imin. The viewer may turn as he or she chooses: content on the screen may guide the viewer by means of visual continuity between screens, or through strategic aural cues from various speakers. Some content is non-linear, disorienting, and even chaotic; the user may watch one screen, or may experience all four screens and speakers simultaneously to create a collage of sights and sounds that is greater than the sum of its parts. Upon reaching its end, the pre-created content fades back to the live webcam feed of the surrounding gallery, only now there are visual distortions in the live feed. The participant may opt to remain in this filtered reality, or they may choose to lower their head from within to rejoin their body, along with the rest of the world. The initial video created for imin establishes a fiction surrounding the device. Not only does imin create immersive virtual environments; it analyzes what portion of the environment the user is watching at any given moment, and analyzes how their body is responding to it. imin then delivers content back to the user in real-time based on their viewing behavior. In addition to delivering content tailored to the individual, the user’s viewing habits determine what type of filter will be placed on the user’s view of reality. While imin itself doesn’t actually monitor the user’s behavior, this fiction exists as a framework for the narrative constructed within the box. When a user enters imin, the video sequence they see is a “calibration” of sorts–the video everyone sees their first time that establishes what kind of content they desire for their subsequent imin experiences. Max, the monotone guide in the calibration process, explains all of this to the user in the calibration video, and then proceeds to play a series of “imin shorts” indicative of the kinds of experiences possible inside imin. imin facilitates a rudimentary virtual reality where the screens work together to create the illusion of a persistent 360 degree environment. The small-scale intimacy of imin contrasts the grand spectacle of IMAX. Additionally, imin is short for imin [a box] (“I’m in a box”), both for the literal box you must place your head in to experience the device, and for the figurative box we place ourselves in when we experience immersive virtual environments. imin playfully explores the isolation inherent in inhabiting a virtual reality, both through the content on the screens, and through the design of the device itself. The box effectively separates the user’s head from their own body, and the outwardly extending legs that support the table, which allow the participant ample room to rotate, effectively deter others from engaging the person within the device. The temperature inside of the box is much warmer than the room outside, which further enforces the stark difference between the world outside the box, and the world within. The virtual worlds within create spaces both claustrophobic and expansive; chaotic and serene; though each evokes a sense of isolation. imin, in its fiction, employs the use of Big Data analytics to improve the user experience. The multitude of experiences we engage with today–from reading news websites to ordering consumer goods online–keep track of our user experience, in order to benefit that user experience. Why shouldn’t entertainment do the same from the bottom up? Though there is no explicit mention of the kinds of monitoring technologies used in imin, I imagine they would combine sophisticated cameras and eye trackers, non-intrusive EEG’s and bio-marker monitors to understand the user’s exact response to the content they’re watching. With this wealth of data, highly complex algorithms will parse the numbers, and deliver in real-time a sequence of video tailor made to the individual. Does a user respond more to jump-scares and macabre monsters, or a character drama? The more you experience inside imin, the more imin gives you what you want. The utopian view of “what I want whenever I want it” offered in imin promises a more dystopian reality of endless feedback loops and empty, superficial content.